Mario Monti's decision to run in the next Italian election is a positive development for the future of Italy and the stability of the Eurozone. At this stage the last thing the global economy needs is the return to fears of the euro area breakup, particularly if it's driven by Italy. Those who profess that Italy should consider exiting the union simply don't comprehend the impact such an event would have on the global financial system. And Monti has been instrumental in bringing credibility to Italy's commitment to stay in the union. Bloomberg: - Italian Prime Minister Mario Monti said he will lead a coalition of centrist political parties that support his agenda of fiscal rigor and pro-European policies in February elections, marking a de-facto bid for a second term. Monti’s announcement, made at an impromptu press conference in Rome yesterday, takes his political role in the upcoming vote a step further after the former European commissioner said Dec. 23 that he would consider leading a group of parties supporting his agenda. “A new political movement is being formed,” Monti told reporters in Rome. The 69-year-old economist is heading a coalition that includes small parties led by Catholic politician Pier Ferdinando Casini and Luca Cordero di Montezemolo, the Ferrari SpA chairman, who formed a new movement in an attempt to lure Monti into the race. However Mario Monti will face two key challenges in his attempt to remain Italy's prime minister. 1. 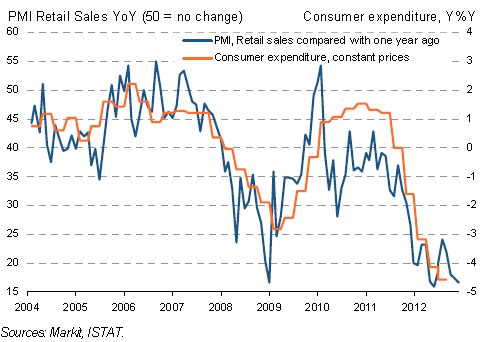 Italy's consumer recession is worse than it was in 2008. There is no question that a portion of the voters will blame it on Monti's policies, which were inevitable in order for the Italian government to remain solvent. Italy in effect has undergone its version of the "fiscal cliff". 2. Berlusconi will continue to undermine Monti's efforts. He will level accusations and spread rumors in order to vilify the current prime minister. His recent approach is to label Monti as a "leftist" (even though Italy's business community generally supports Monti). Reuters: - Silvio Berlusconi said on Saturday that outgoing Prime Minister Mario Monti was plotting with the left in his centrist alliance's bid to win Italy's national election in February, but centrist leaders denied any secret accord. Speaking to reporters at Milan Central railway station, Berlusconi said Monti wanted to help the left secure power after the February 24-25 election so he could continue his austerity agenda of tax hikes and spending cuts. "This grouping has been formed to favor the left - also the harmony with the left's programme they have celebrated heads in this direction," he said, after earlier describing Monti as "the spare wheel" of the PD in an interview with Vista TV. But it doesn't take much to see what Monti has been able to accomplish during his short tenure. The yields on Italian government paper are now the lowest in over 2 years. Clearly at least some of that should be credited to the ECB, but this would have been an impossible task if Berlusconi was still in power. Italian voters, who (for now) don't have to worry about their deposits and pensions being converted to lira, understand this and are likely to support Monti's bid for re-election.